SUPREME COURT TO DECIDE THE FATE OF GARISSA GOVERNOR. 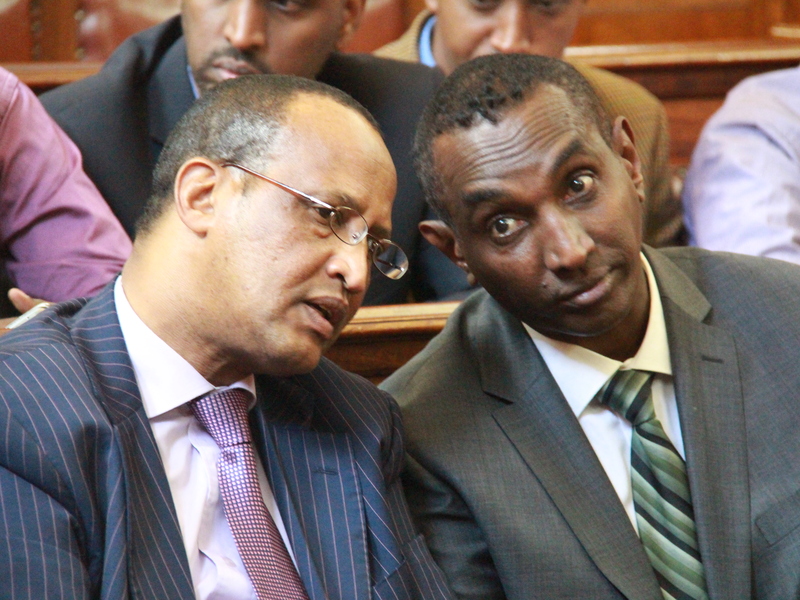 The embattled Garissa governor Nathif Jama Adam consulting with one of the garissa county MP who attended the hearing of his application at Supreme Court today. The Supreme Court has given Garissa County Governor temporary reprieve after it extended an order halting his removal from office in view of the judgment of the court of appeal which found him invalidly elected. The court heard the appeal court exceeded its jurisdiction and addressed itself on issues which were not raised by two voters who challenged the election of the governor. He asked the court to issue a conservatory order halting the judgment of the appellate court until the appeal before them is heard and determined. Mr. Ahmednassir said that his client ought to remain in office discharge his duties until the highest court in land makes its decision on the appeal which has been triggered by the appeal court. The court will endeavor to consider the submission by the lawyer representing the aggrieved governor. SENIOR OF OFFICERS OF A MILLING COMPANY CHARGED IN COURT FOR 218 MILLION THEFTS. Wilson Ndungu Kamomoe, Mohamed Nasir Khalifa and Josphat Okeo Kegengo appeared before Nairobi acting Chief Magistrate. A wheat supplier and two senior staff members of a milling company were today charged with stealing over Sh 218 Million from the company out of which Sh 1.2 Million was recovered. 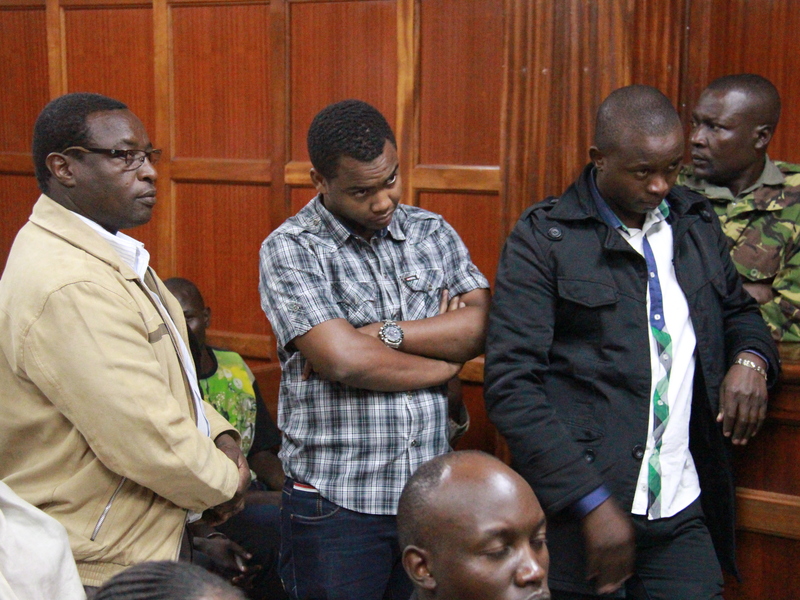 The three Wilson Ndungu Kamomoe, Mohamed Nasir Khalifa and Josphat Okeo Kegengo appeared before acting Chief Magistrate Daniel Ochenja where the second accused alleged that the company’s auditor and police tricked him to withdraw Sh 1, 27,000 from his account. However the investigating officer Corporal Joseph Mucheru of CID headquarters informed the court that amount is being held by police as evidence. “Upon recovery the accused swore an affidavit before a commissioner of oaths that is why the amount was handed over to the police and it will be used as an exhibit onces trial begins,” Said Mucheru. Kamomoe, Khalifa and Kegengo were accused that on diverse dates between July 22 last year and February 8 at Pembe Flour Mills factory along Lunga Lunga Road within Nairobi County jointly with others not before court fraudulently conspired to defraud the company Sh 218,665,038 by false pretences. They also faced a second count of stealing contrary to section 268(1) as read with section 275 of the penal code where it was alleged that on the said dates at Barclays Bank Enterprise road branch jointly with others not before court they stole Sh 218,665,038 the property of Pembe Flour Mills Limited. However the accused denied all the charges leveled against them and were directed by the magistrate to deposit cash bail of Sh 7 million or bond of Sh 10 million to secure their freedom. He directed the case to be heard on July 2. Meanwhile a bank teller has been charged with stealing Sh 11 million from Imperial Bank. Noah Randy Omullo appeared before Resident Magistrate P.M Mugure accused that on or before December 10 last year at unknown place jointly with others not before court they conspired to steal Sh 11, 500,00 property of Imperial Bank. Omullo was further accused that on the said date at the bank’s Upperhill branch being an employee of Imperial Bank as a teller he stole Sh 11,500,000 which came into his possession by virtue of his employment. He however denied the charges and was ordered by the magistrate to deposit cash bail of Sh 2 million. The case will be mentioned on June 5. INDUSTRIAL COTU BLOCKS PUSETU FROM INTERFERING WITH LABOUR DAY CELEBRATIONS. 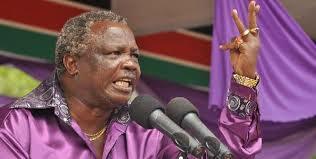 Trade workers union boss Francis Atwoli during the last year labour day in Nairobi. The high court has issued orders restraining Federation of public service trade unions of Kenya pusetu from interfering with Labor Day celebrations organized by its rival Central organization of trade union. Industrial court judge Monica Mbaru issued the restrain orders yesterday after COTU said PUSETU has threatened to interfere with the lab our day celebrations which may cause violence . In its documents, Cotu says it has taken over 1 year to prepare for the may 1 celebration. And the same not be disrupted by constitutional body or group. COTU’s lawyer Judith Guserwa told the court that all workers have prepared to take part in the celebration without interference from any quarters. INDUSTRIAL COURT HAS HALTED TELKOM FROM ITS ASSET. The Industrial court has issued further orders restraining Telkom Kenya limited from selling its assets that are spread all over the country until an award of Sh 3.2 billion is paid to former employees as ordered by the high court. The former workers sought an injunction to stop Telkom Kenya limited from transferring its properties to a third party while their claim has not been paid. They said and held the appeal in which former state corporation was ordered to pay the retrenched workers Sh 3.2 billion. They were aggrieved with decision of the company and moved to court, the high court directed the company them severance sum and a Golden Handshake. CCK HAS LOST SUIT AGAINST MEDIA OWNERS ASSOCIATION. 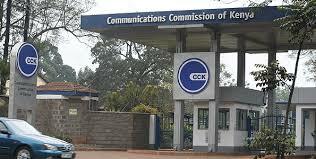 The high court has declined a bid by the Communication Commission of Kenya (CCK) to strike out an application by Media Owners Association over issuance of licenses. Justice Isaac Lenaola said he could not dismiss the application by MOA because it raises important issues that need to be determined by the court. CCK had asked the judge to reject a petition filed by MOA and Magic Radio Limited arguing that the issues before court had been dealt with in another court. But justice Lenaola directed the matter to go for full hearing saying it would be unfair and unjust to shut out parties from submitting on serious issues on grounds that they had been determined by another court. MOA moved to court after CCK invited broadcasters to apply for licences under the newly formed Regulatory framework. CCK gave broadcasters a deadline of November 15 2011 to confirm compliance. MOA contention is that CCK is not the body envisaged under article 34 of section 5 of the constitution because it lacks independence. The association says the body’s board of Directors as established under the Kenya Communication Act of 1998 lacks autonomy as it consists appointees of the President and the Minister in charge of communication. The appointees include Principal Secretaries in the ministries responsible of communication, Finance, internal security as well as information and broadcasting. MOA says the panel can not be fair and want the court to declare that its right under article 34 of the constitution have been infringed and threatened with violation. 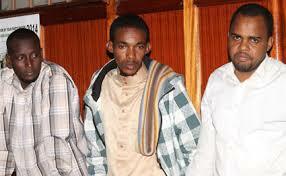 THREE TERROR SUSPECTS LINKED TO PANGANI EXPLOSION REMANDED IN CUSTODY. Three terror suspects in the Pangani attack Ahmed Dugal Ali, Abdiaziz Bulle Ali and Mohamed Abdullahi Falir at Milimani Law Court. The court has ordered three terror suspects in the Pangani attack to remain in police custody for ten days to allow police complete investigations to the incident. Senior Principal Magistrate Edda Agade allowed the application by Corporal Cyrus Ikade on grounds that police are still investigating the incidents that claimed the life of two police officers during the explosion. The court said that the matter is sensitive and attaches on state security and police should be given more to complete investigation. In an affidavit sworn by the officer, says that the accused Ahmed Dugal Ali, Abdiaziz Bulle Ali and Mohamed Abdullahi Falir are be believed to be members of Al-Shabbab group. He says that the first accused Dugal Ali is the owner of the motor vehicle which was used during the Pangani police station explosion in which to two terror suspects also died. The officer further deposed that the second and third accused persons Bulle Ali and Abdullahi Falir are close associates of the terrorists who died during the attack, saying that police are still pursuing their accomplice. The suspects are dangerous to the security of the state and the public in general, the officer says in his affidavit. The presiding Magistrate ordered the suspects be remanded at Muthaiga police for a period of ten days and they be produced in court on May 12. PRESIDENT UHURU DISOWNS BARASA PLEA TO STOP ICC TRIALS. 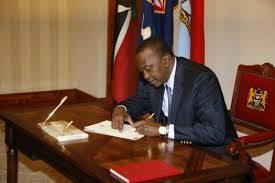 President Uhuru Kenyatta signing a document at state house Nairobi. President Uhuru Kenyatta has disowned a case filed by embattled journalist Walter Barasa on withdrawal of charges against him and his deputy at the International Criminal Court. The President, through lawyer Kennedy Ogeto says he was improperly enjoined and listed in the suit, as he was not consulted and wants to be distanced with the case. Barasa, who is fighting extradition to the ICC, moved to court last December seeking orders to quash Uhuru ,Ruto, and journalist Joshua Arap Sang’s trial on grounds that they are constitutionally invalid, null and void. Uhuru however, says in his grounds of opposition against the case that he has been improperly enjoined in the suit and faults the Eldoret based scribe for failing to consult him before dragging his name to court. He says Barasa’s petition should proceed and the court makes its informed decision without his participation. “The first interested party has been improperly enjoined in this petition and his name should be struck out” read parts of the document filed by lawyer Kennedy Ogeto on behalf of the president. Ruto, has also distanced himself from Barasa’s case. He too says that he does not want to be involved in any way because he is ready to face his accusers at The Hague. The deputy president told court last month that he has decided out of his own volition to attend and participate in the ICC trials to establish his innocence. Barasa argues through lawyer Kibe Mungai, in the case being handled by a three-judge of Isaac Lenaola, Mumbi Ngugi and George Odunga that the Rome Statute was not in force in Kenya when the post-election violence occurred between December 3, 2007 and February 28, 2008. Kibe says the crimes against humanity preferred against the three Kenyans on account of Article 5 of the Rome Statute were not recognized under Kenyan law or under Section 77 (8) of the defunct constitution during the bloody mayhem that left over 1000 people dead.